We know an expansion is near at hand in Guild Wars 2–late Summer or early Fall based on what’s coming out of ArenaNet–but we know virtually nothing about it. Yes, there was that leak on Reddit, but I don’t like reading or encouraging leaks (though I must admit I skimmed through the images briefly) and there’s still a lot those don’t tell us. It’s a little ridiculous that we’re supposedly this close to the expansion and we don’t know much of anything, but I’m guessing that releasing too many details, maybe even the expansion name itself, would be spoilers for the end of Season 3. Kind of poor planning if so, but whatever. Regardless, I’ve been thinking about what I’d like to see in the next expansion to Guild Wars 2. Ideally, I would love it if every MMO expansion had a new race or class to experience. Too many expansions are basically just a level cap bump and a continuation of an existing story (I’m looking at you, SWTOR), but Guild Wars 2 doesn’t do level cap bumps, and it gives away Living World story updates for free, so without something more, that would seem like even more of a ripoff than in other games. New classes give me a whole new way of playing, breathing new life into even old content. You may recall that I didn’t really dig into the Heart of Thorns expansion for months because I was having so much fun leveling my Revenant. New races, too, give me an excuse to roll up an alt and see the world from a new perspective. 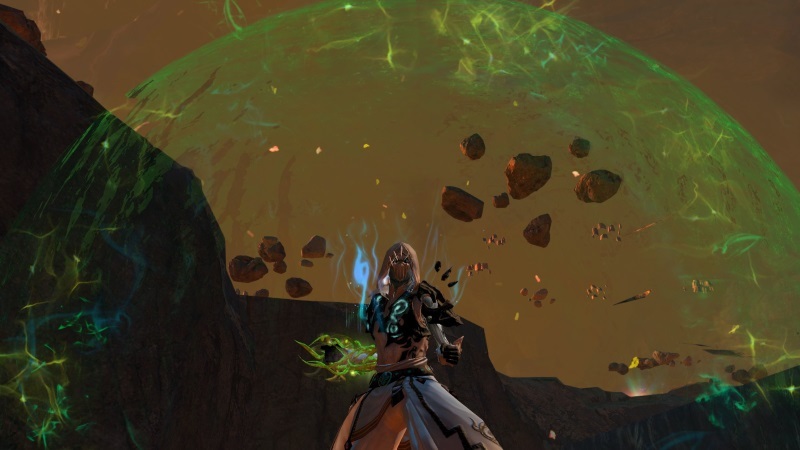 The problem with adding races is that Guild Wars 2 has kind of painted itself into a corner with its personal story; it wouldn’t make sense for a member of a race we’ve never seen before show up and become the pact commander and slay a couple dragons years before we’ve even encountered that race. A new race would either have to start out at 80 and jump straight into the accompanying expansion (which would be kind of lame) or have a full 1-80 story all its own, which would require a lot of writing, voice acting, and several new sub-80 zones, all of which seem unlikely. Sadly, adding new classes also presents a problem. You can’t really add a new class every expansion or it will eventually become overwhelming. As much as I love creating new characters, some people don’t, and new players can be intimidated by too many options, especially if they see that some of those options (maybe the ones they really wanted to play) gated by expansion paywalls. Elite Specs further complicate the issue; assuming we add one new class and one elite spec to all of the existing classes, the new class is always going to be one behind, since it wasn’t around for the Heart of Thorns wave of elite specs. None of these things prevent them from creating new races or classes, but right now it certainly seems like it will get less likely with each expansion. I’m pretty sure this is a given at this point. I really like almost all of the classes in Guild Wars 2 as they stand, but more choice is always better. I love the idea of being able to make major changes to the way my class plays based on what spec I choose. Classes get a new weapon, several new slot skills, and sometimes even end up being able to fill a new role (most notably the ranger’s druid spec). It’s a nice middle ground between the rigid classes of more WoW-like MMOs and the overwhelming amount of customization available in games like Rift and Elder Scrolls Online. Right now there is only one elite spec for each class, and it’s almost universally better–at least for PvE–to have your elite spec slotted, even if you don’t use the weapon that it gives. But very soon that’s all going to change, and I’m excited to see what unfolds. I like that Guild Wars 2 has chosen to not bump up the level cap with its expansions. Level cap bumps only serve to invalidate old gear and make old content irrelevant, especially in a game with level scaling. The problem is that you really need some kind of mechanic that slows players down, a brake that keeps players from simply binging through the story and coming out feeling unsatisfied. That mechanic should be fun, and Heart of Thorn’s mastery grind wasn’t particularly fun. There were a couple of problems. First was that, if you knew what masteries you needed to progress in the story ahead of time, you could focus on those masteries as you went, and it didn’t feel so much like the game was saying “ok, now stop and grind to an arbitrary level before continuing.” But there was no way for you to know unless you looked up a guide or talked to a friend who had already been through it. The Living World stories did better at pointing out the elite spec before you ran into its gate, so hopefully the new expansion will do the same. Second, I think the system would work better if there were a whole bunch of little masteries that cost one or two mastery points each instead of each tier costing more, up to twelve for the really high end ones. I know that’s probably easier said than done, but I think it would give a better sense of progress and feel less grindy. My biggest annoyance with Heart of Thorns was not the mastery grind, it was getting around those awful zones. There are so many sheer walls and layers on top of each other that the map is practically useless for navigating. Auric Basin isn’t bad, Verdant Brink would be tolerable if there weren’t random mastery- and hero points that you have to glide to from a boss fight in the sky, but Tangled Depths is the absolute worst. I basically only go there for the story and if I’ve absolutely run out of reasonably doable hero points in the other zones. Add to that the fact that the number of waypoints per zone in these areas is about a third was it was in the vanilla game, none of them near where you’re likely to die, and it’s just an overall frustrating experience getting around in the newer zones. Masteries make it a little easier to get around, but even with them it’s incredibly frustrating. I think ArenaNet has learned their lesson from Heart of Thorns, as the Season 3 maps have been a lot easier to get around in. Draconis Mons is the only zone with a lot of layers, and with the grappling hook-like Oakheart’s Reach mastery, it’s actually fun to get around. Two stories in a row about dragons is fine. Whatever. But there’s so much more you could do! If the living world story is any indication, I may be getting my wish, but I’m still not convinced they won’t throw a random fight with Kralkatorrik in there just for good measure. Oh, but [minor spoilers] don’t kill him, because apparently killing dragons is bad for the environment or something. I 1000% agree with wanting less grinding and flatter maps. Most of the reason why I find it hard to enjoy HoT is because I found it so frustrating not only having to grind so much to level masteries, but also trying to navigate treacherous maps while also lacking a lot of the masteries I didn’t want to have to grind. Here’s hoping this new mystery expansion will have less of both of those things.